When I attended university I remember meeting a young woman, Maranelle Recorde, who explained to me that she was a direct descendant of the man who invented the = sign. I was astounded! Until that time it had never really occurred to me that all the symbols that I used in mathematics … ALL of them … had to be invented at some time. I hope you find that an amazing thought, too. This page will be devoted to describing the origins of symbols. It will provide if you like, a series of vignettes. 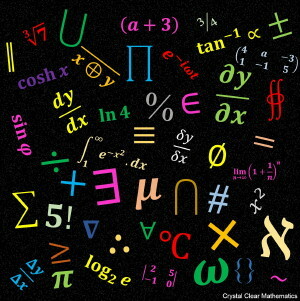 You will catch a glimpse, here and there, of mathematicians at work, trying to create meaningful symbols to convey their thought processes and arguments to others. This is a story of communication … communication of ideas and thoughts, every bit as broad and subtle as we encounter in literature. 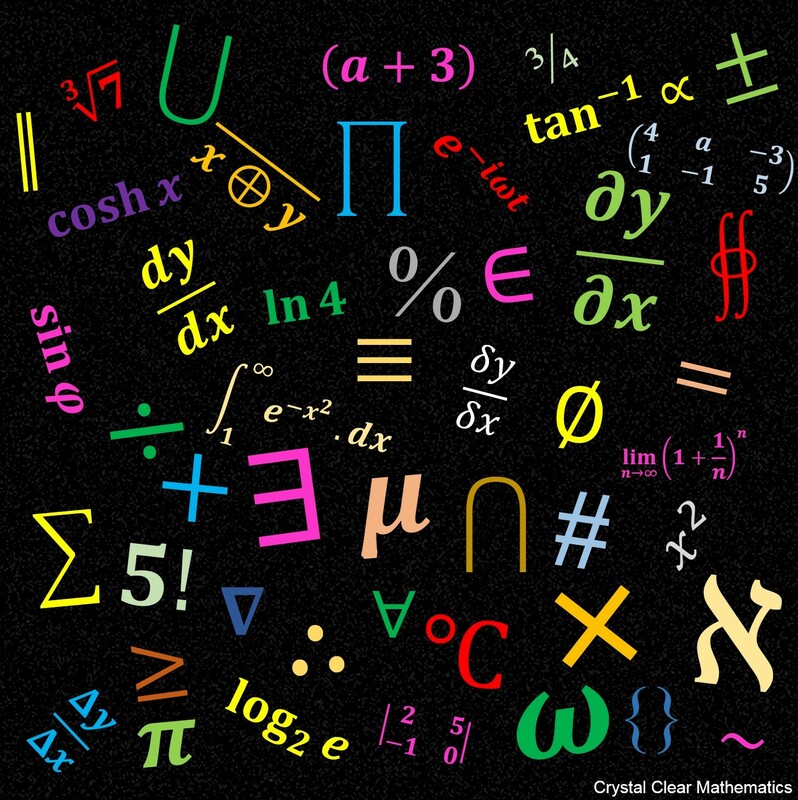 Originally, of course, mathematicians wrote everything in words, but that process became too clumsy to convey precise information about shapes and number and patterns and ideas and logic. First they developed numerals. That was predictable. But it was many, many years before the zero was invented! The plus and minus sign and equals sign came many centuries after that. Today we have a plethora of symbols and they are in a state of flux. When I was a boy, I read text books that wrote five factorial as but it is now written 5! Also, more than half the mathematicans who ever lived are alive today, and they are expanding the numerous branches of mathematics at something like 250,000 published theorems per year! All these new fields require their symbols, too! I did things all "back the front" for this video. Having received a facsimile of Robert Recorde's original book, The Whetstone of Witte in the mail, I rushed to share it with you before fully researching the material. I added the refinements in translation to the video later by adding text! I hope you don't mind the rawness of it all. This is a most amazing work, and Robert Recorde was quite an amazing person. He was born in Wales and lived during the exciting, but dangerous, times of Henry VIII, Edward VI, Lady Jane Gray and Mary I (Bloody Mary). His primary training at Oxford University was as a medical doctor. Robert Recorde was a supporter of Reformation and this carried over to his mathematics. He wrote a number of texts on arithmetic, algebra, geometry, navigation and medicine in English (not Latin) and he wrote with the intention that everyone could learn mathematics and gave lots of descriptions and common examples from everyday life to illustrate his work. In doing so, he created/used English terms for many concepts and ideas (such as the tangent to a circle being called a "touching line"). He popularised the use of the 'Hindu-Arabic' numeral system in England, as well as the "+" and "-" signs that had been developed in Europe. In some ways, he was to English mathematics what Leonardo of Pisa (Fibonacci) was to European mathematics (Fibonacci introduced Arabic numerals to Europe and showed merchants and others how to use them). 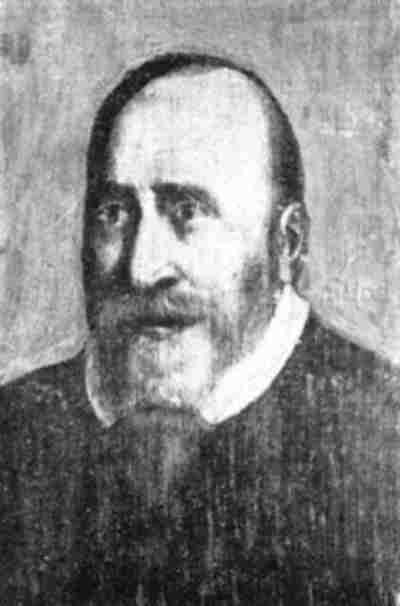 Robert Recorde is also famous for inventing the "=" sign which made the solving of algebraic equations so much easier. His first book, the Grounde of Artes (1543), was primarily an arithmetic book, but is also remembered as the first English book of algebra. By 1548 he had also written and published his medical work, The Urinal of Physick. He published a book of geometry and astronomy in 1551 titled, The Pathway to Knowledge. This was the same year that he was appointed under Edward VI to govern the silver mines in Ireland, and shortly before Edward produced the first English silver coin to bear a date in Hindu-Arabic numerals rather than Roman numerals. In 1556 he published The Castle of Knowledge, a book in which he discusses the Ptolemaic universe (a treatise on circles and spheres) and mentions the work of Copernicus. And, the following year (1557), he published his last book, the one that I discuss in this video, called The Whetstone of Witte. It is in this work that he introduced his "=" sign. Sadly, he had made a significant political enemy in those hard times and, in the same year that he published The Whetstone of Witte, he lost his court battle (he was charged with libel) and was sent to prison where he died around the middle of the following year (1558). It is said of him that it was he who established the English school of mathematics ... and it was he who first introduced algebra to England. What a legacy he has left! He was obviously a fine and experienced teacher of mathematics. That much shines through his work in the care he takes to ensure that the reader UNDERSTANDS WHY certain things are as they are, and why problems are solved in certain ways. Let me add two more observations: The first is that, when he wrote of "a pair of parallels, or Gemowe lines of one length" in presenting his "=" sign, the word Gemowe means 'Gemini' or 'twin.' The second comment concerns his final book, "The Whetstone of Witte." The title is, in fact, a clever pun. In those days, no one spoke of 'algebra.' What we call algebra today was known as The Cossick Art. Mathematicians who studied algebra were called 'cossists.' This is because, in Latin, 'cosa' meant 'thing,' and algebra is a language that describes and manipulates 'things.' But the (similar) Latin word 'cos' means 'a whetstone' which is a stone used for sharpening knives, axes, and other such blades and tools. So, playing on the Latin cos/cosa, Robert Recorde presented his text as a book on which his readers could sharpen their wits! 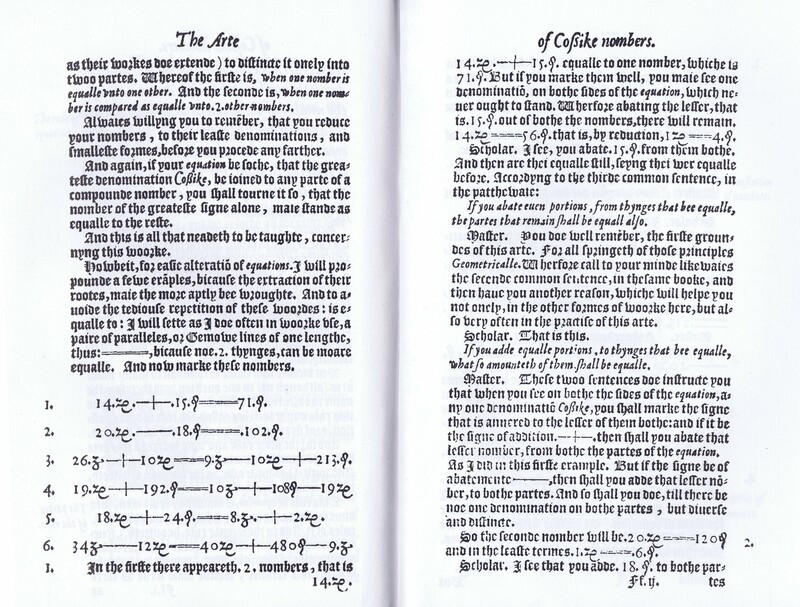 If you wish to examine a fairly detailed copy of the pages from The Whetstone of Witte that contains Robert Recorde's first use of the equals sign, you may right-click on the image below and save the file. 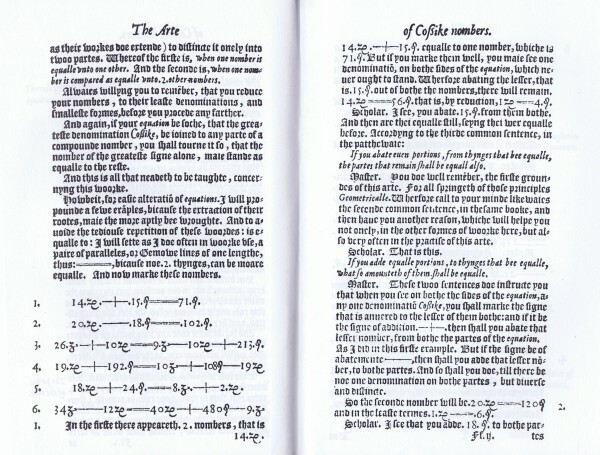 By the way, on these pages, you not only have the first printed use of the equals sign; you also have the first algebraic equations ever printed using the equals sign in a form that we can recognise. In the first equation on the left page, the symbol after the 14 is the unknown. We would represent that with an x today, but that invention/convention was still about another century in the future in Robert Recorde's time. The symbol following the 15 and the 71 was simply meant to inform the reader that those numbers were constants. For obvious reasons, they were rapidly dropped and regarded as unnecessary. Therefore, the first two equations ever published in this form would read 14x + 15 = 71 and 20x - 18 = 102. You might like to solve them and follow in some 'historical' footsteps! The z-like symbol that follows the 26 in the third equation (and which appears in the remaining three equations) would be replaced nowadays with x² ... so you can see that Robert Recorde was proposing to explain to his readers how to solve two linear equations and four quadratic equations using the Art of Cossike Numbers! THANKS A LOT! YOU MADE ME TO LOVE DERIVATIVE! WELL UNDERSTOOD!